The flick is directed by Robert Redford and follows the path of Mary Surratt who was gathered up after Lincoln’s shooting and charged as one of the plotters of the assassination. But as the drama unfolds the big question becomes: What did she know and when did she know it? Or, did she even know anything of the plot? 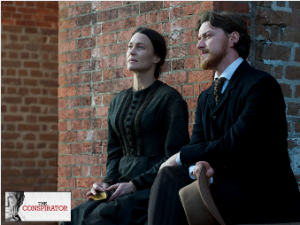 Historically accurate and filled with realistic actors/actresses dressed in period clothing set in April/May 1865 Washington, DC, this movie creates many more questions in the viewers mind about the guilt and innocence of Mary Surratt, who is deftly played by Robin Wright. I particularly enjoyed the character of Frederick Aiken, a Union officer and pre-war lawyer played by James McAvoy, picked to defend Surratt. Torn and tormented by his allegiance to the Union and his fallen president, Aiken eventually realized that the members of the military tribunal seemed prejudiced against his client. Once he realized that the evidence or lack thereof did not matter, he put up a firestorm of a legal defense for Surratt. Kevin Kline played the part of U. S. Secretary of War Edwin Stanton. The only disappointment I had with Kline’s performance was his beard did not droop down as far as the beard of the ‘real’ Stanton. Stanton, not trusting the fortitude of the vice-president, seized control of the Federal government in the wake of the plot and martial law fell over the area. Norman Reedus played the part of Lewis Powell and the make-up artists made Reedus look eerily like the pre-execution photos taken of Powell before he ascended the scaffold. I don’t want to say anything else for fear of revealing too much. If you want to get a history lesson on a little known topic related to the War I suggest seeing this excellent movie before it leaves the big screen!